Natalia Tretyakova, Distinguished McKnight University Professor, Department of Medicinal Chemistry, has been named a Fellow of the American Association for the Advancement of Science (AAAS). Election as an AAAS Fellow is an honor bestowed upon AAAS members by their peers, and recognizes efforts on behalf of the advancement of science or its applications that are scientifically or socially distinguished. Tretyakova was elected in the Section on Pharmaceutical Sciences for distinguished contributions to the field of chemical carcinogenesis and chemical biology. “I am honored to be recognized for our work in the field of chemical biology, chemical carcinogenesis, and epigenetics,” said Tretyakova, who is also a Masonic Cancer Center member. 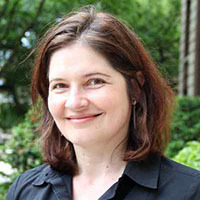 In her research, Tretyakova uses chemical biology, analytical chemistry, and biochemistry to investigate the mechanisms of cancer initiation by exogenous and endogenous chemicals, to determine the modes of action of antitumor drugs, and to develop novel nucleoside analogs as molecular probes and biologically active compounds. Tretyakova now joins seven other AAAS Fellows from the College of Pharmacy: Gunda Georg, Patrick Hanna, Rodney Johnson, Philip Portoghese, Tom Shier, Robert Vince, and Carston (Rick) Wagner. Tretyakova will be formally announced as an AAAS Fellow on Friday, Feb. 15 during the 2019 AAAS Annual Meeting in Washington, D.C.